One of the 100+ Austin K2 vehicles which were deployed from the fire service inspectorate to brigades in need. a classic example of an appliance still in use overseas after hostilities. is the appliance still in preserved today?. Added by Pete Matten on 23 February 2009. Yes she is still preserved by the firemen from Maurik. No idea when she was replaced. Added by Fire995 on 25 February 2009. Many British ATVs were "left behind" in the Netherlands and used for decades after the war - as the local fire brigades gradually rebuilt their fleets after being robbed of much of their equipment during the war years. 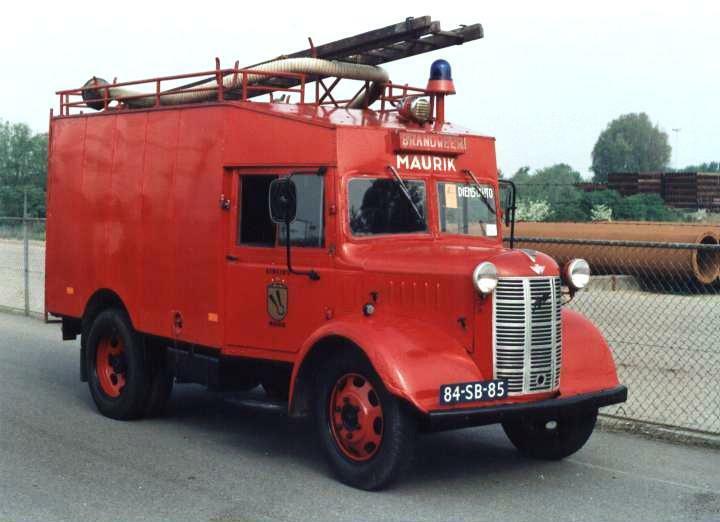 Similar outcomes occurred in France, where hundreds of ex US army GMC 2.5 ton 6X6 trucks were converted for firefighting. These ATVs were joined by quite a few ex Canadian Chevrolet army trucks. These too were painted red, and looked all the better for it!